I'm new here. I've had a national/rose hive for a couple of months and this afternoon I became a top bar beekeeper. I'm posting this to demonstrate the method I used for taking a split from my framed hive and putting it in a top bar hive. 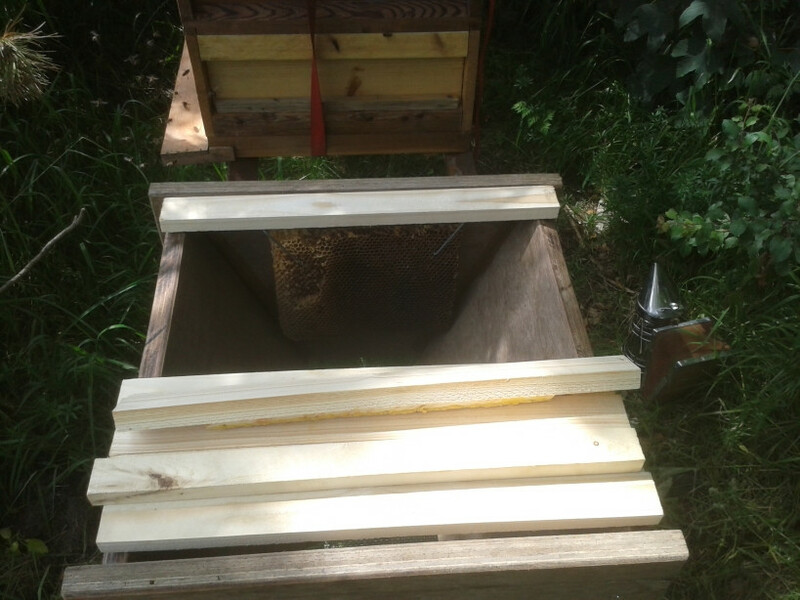 Firstly, I should mention that I built a small top bar hive to get me started. It is built to the general specification laid out in Phils design, but it is only 460mm long. I will be building a bigger one soon, but this one allows me to use an existing roof, and it will hopefully be useful for collecting swarms or moving nucs in the future. I took some photos to show what I did. The first one shows a makeshift work table with some tools on it. In the background you can see a frame/topbar holder that I made copying a design I think Phil came up with. In front of that is a stick with 220mm and 110mm marked out on it. There's a snips and a knife, and finally, my special topbars which I designed for hanging cut comb on. These top bars have a pair of 3mm holes drilled through the top of the comb guides. There are 4 hangers made of 2.5mm wire, these hangers are 50-60mm long and have a 15mm hook on the top, and another 25mm hook on the bottom. This is a frame of cold honeycomb that I previously took from my hive. I am using it to practice my technique on before I try cutting up frames of warm brood covered in angry bees. You can see the measuring stick I made resting on top of it. I will be cutting out sections 220mm wide and full depth to fit them onto the top bars. The following picture shows some limited success I had on my first trial. I had spaced the hangers 220mm apart (110mm from the center line of the topbar). This was an error, since they cannot grasp the honeycomb without being at a significant angle to vertical. I had designed this contraption in my head without drawings and now I was suited up next to my hive and it was failing. 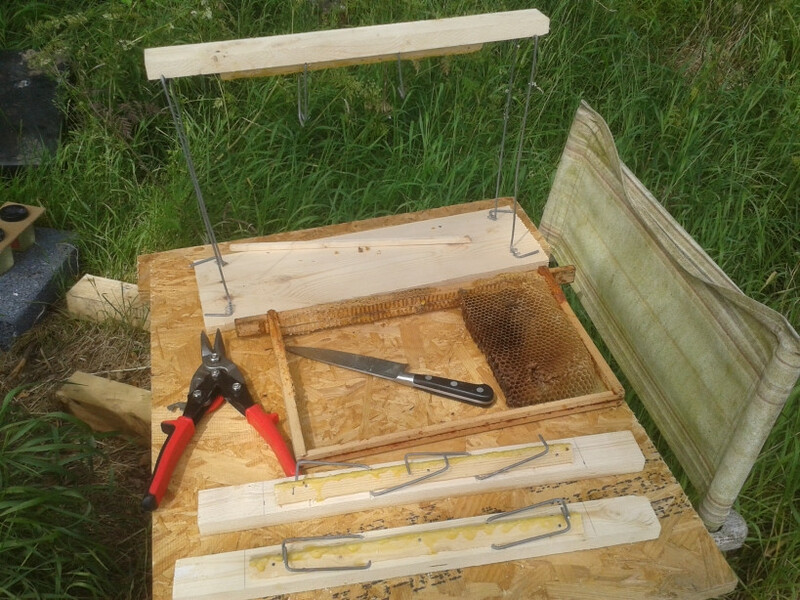 I quickly decided that I would put the first topbar into the new hive as it was and quickly modify 3 more top bars before using hot comb. You can see the first bar inserted here and my national hive in the background. The lighting isn't very good though. A quick visit to the workshop to grab my drill and I ran back to drill 6 new holes in 3 more frames. These holes were about 50-60mm from the center line of the top bars. If you compare them with the first image you can clearly see the difference. You will notice that there is a 110mm section of comb left in the frame I cut earlier. This detail becomes important soon. I opened the national and checked for queen cells. I very quickly found 4 cells on 2 frames in the middle of the brood nest. 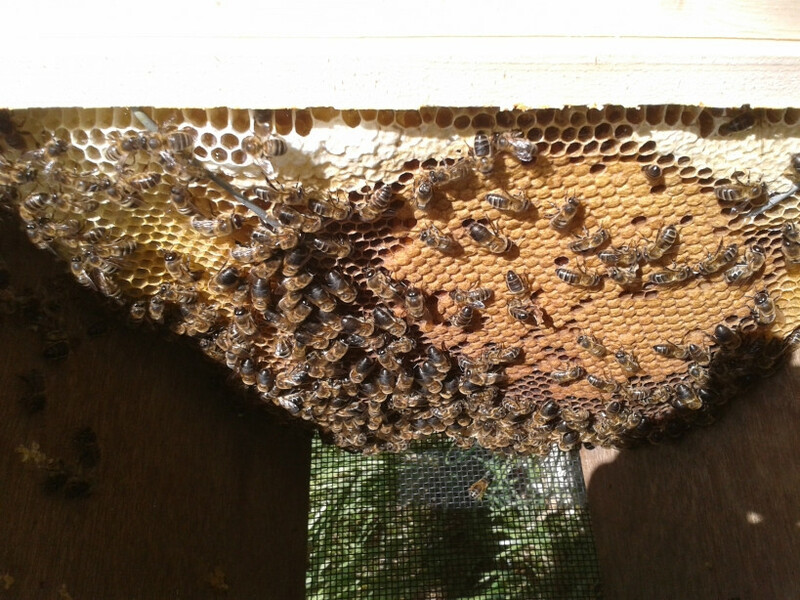 I pulled out a frame and shook the bees into the top bar hive. There were about 5 that wouldn't budge but I left them and started cutting a 220mm section using the knife. This was an amazing experience. My first time ever cutting warm comb. My fingers were instantly covered in honey and bees. Unfortunately I had to decide that taking additional photographs during this process was not a viable option. My phone would have been ruined and I would likely have been stung a lot. The top bar was held in place with the frame holder and had 2 hangers installed in the back of it. I pressed the section of comb onto the 2 hooks at the back and held my breath as I let go. It stayed in place! Victory! 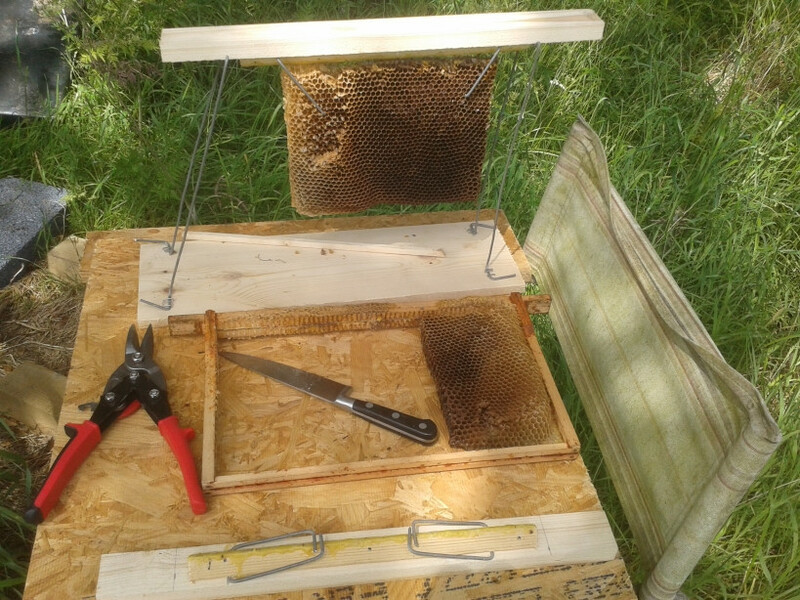 I quickly pressed 2 more hangers into the front of the comb for additional security and placed the first live top bar into the hive. Rinse and repeat. I took another frame from the national. Shook the bees off it into the top bar hive. Ouch, ouch. 2 stings. FFS, things were going so well. 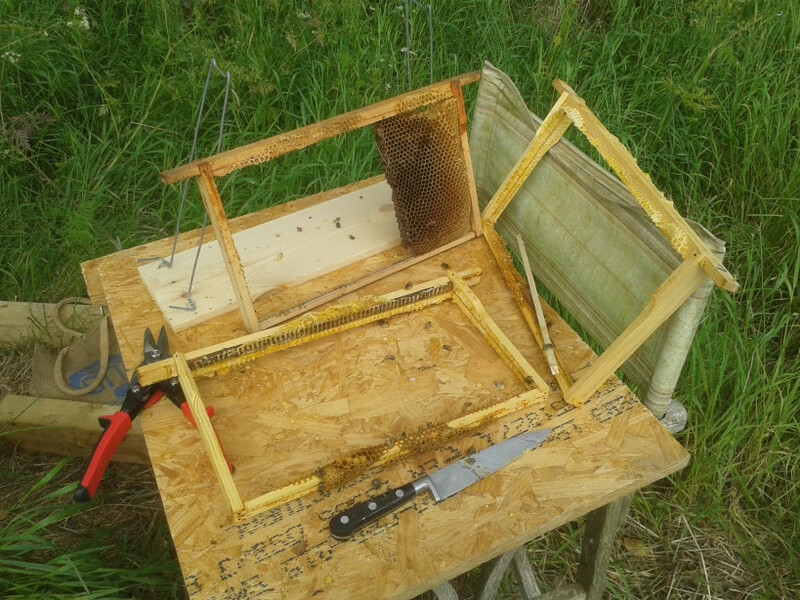 I set the frame down on the table, flicked the bees off me and started cutting another 220mm section. No problems. It went on the hangers just fine. Popped it in the hive. Now I had 3 frames, each with a 110mm section of comb in it. 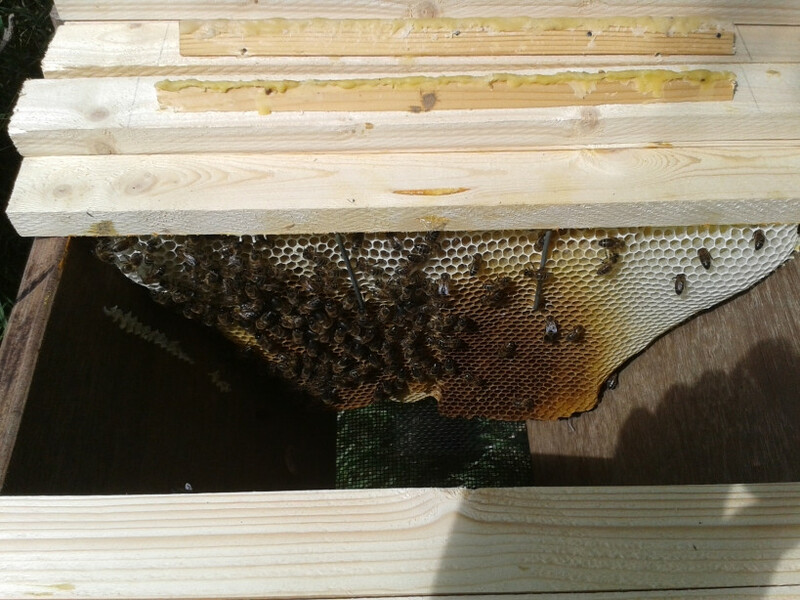 2 of those frames had warm brood in them. I set up another top bar on the holder. I cut out each 110mm section of comb and hung each of them on a hanger. 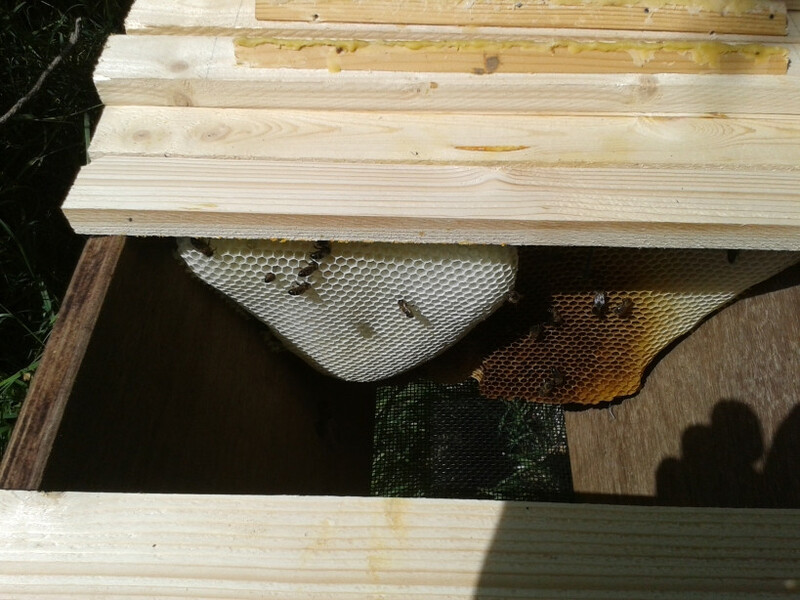 I inserted the remaining 2 hangers to secure the sections and popped a 4th top bar into my hive. In the last picture here, you can see the aftermath of the job. I had a 110mm section of cold honeycomb left on one frame, but it didn't have much pollen or honey in any of the cells. I didn't think it was worth the effort of installing it in the hive. I installed 3 empty top bars with waxed comb guides next to the 4 bars with comb on them. Then there was a follower board and another 2 top bars with a feeder underneath them. I quickly washed the honey off my hands before I closed up the national hive because I was wary of being stung again. I didn't have much time to attend to them with the smoker and they seemed pretty angry about me stealing their princesses. I got it sealed up again without getting stung but I forgot to bring frames to replace the ones I had removed. So that's the story of my first foray into top bar beekeeping. It took longer than I expected to sort out the pictures and type this up. I gotta rush off to see a client now. I'll pop my head in here again later tonight. looks a great idea, well done, why did you not use the whole comb, and then angle the side cuts, to give you more comb at top? I did use the whole comb, there was nothing wasted. I had measured up the size of comb in the frames and the cross sectional area of a follower board before hand. 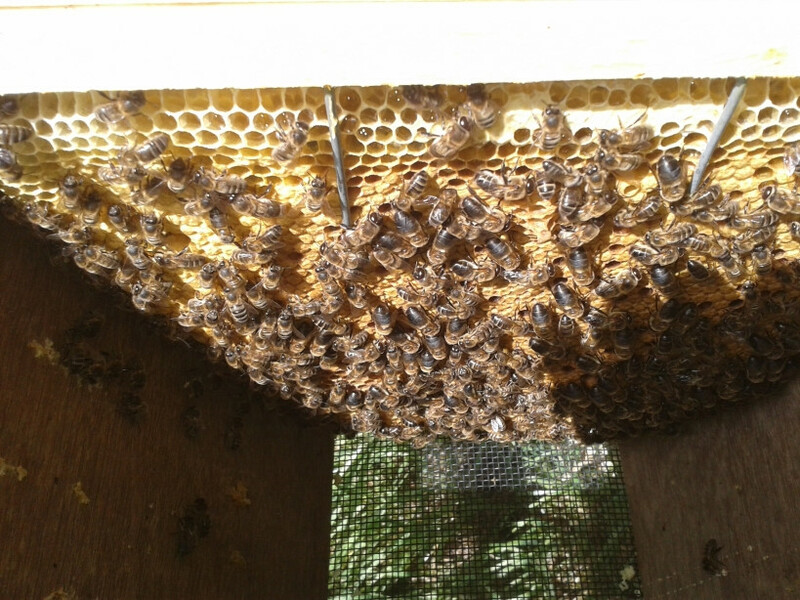 In my case, 2/3 of a frame is a good fit to the top bar hive I built. If I had cut the comb as you suggested I would have been left with some triangular sections which wouldn't be usable anywhere else. The cells are sloped upwards so you can't just turn them upside down when transplanting them. I wasn't going to be filling the hive with comb, so filling out every top bar was unnecessary in my opinion. 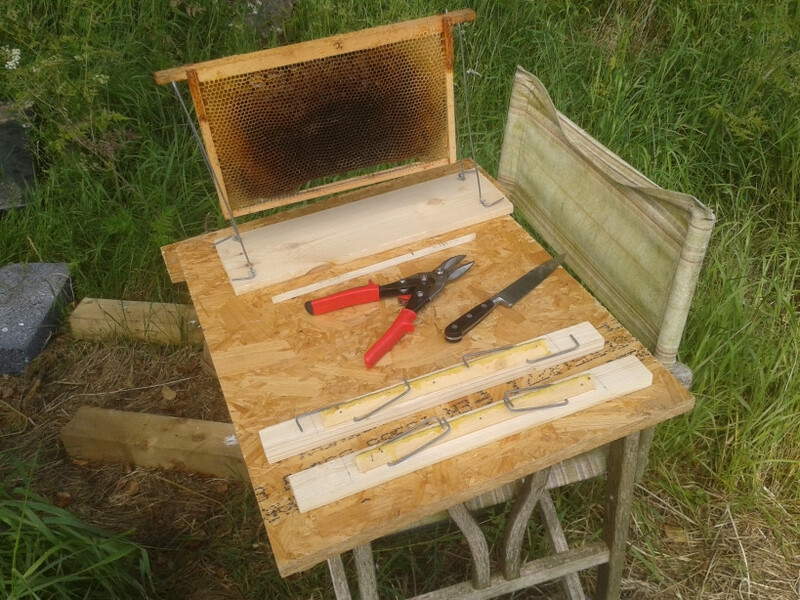 I'm hoping that the bees will connect up this comb quickly and then fill out the missing corners. There is an additional reason for not cutting at an angle which I didn't figure out in advance, but it turned out to be a nice bonus outcome. The wires in the foundation of these frames would have made those diagonal cuts difficult. Cutting along the sides of the frames allowed me to cut the wires using a very sharp knife. The wires were severed right up at the point they met the wood of the frame. There was only one wire that had to be cut at a point that didn't touch the wooden frame, that was near the end of the slice 2/3 of the way across. If I cut diagonally, I would have to cut 6 wires in mid frame which required snips to avoid tearing the comb. These points are just my opinion, based on my very limited experience working with bees. I did a very brief inspection a couple of weeks ago but nothing seemed to be happening and I was worried that the hive was queenless. A local beek told me to just leave them alone for a full month and that I shouldn't have taken even a tiny peek. Well, it's been 29 days now and I just had to investigate because I have an opportunity to get a new queen if I need one. This is a record of the inspection today. 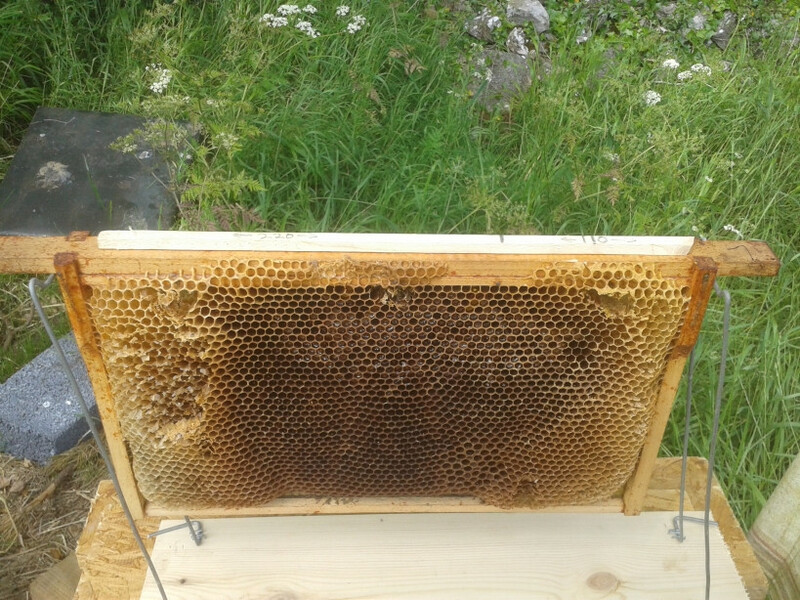 This is a bar of new comb that the bees have started building. The hive entrance is directly below this bar on the left side. This bar contains 2 sections of comb 110mm wide that I cut from 2 national brood frames. The holes for the wire hangers are drilled 55mm from the centreline of the topbar. 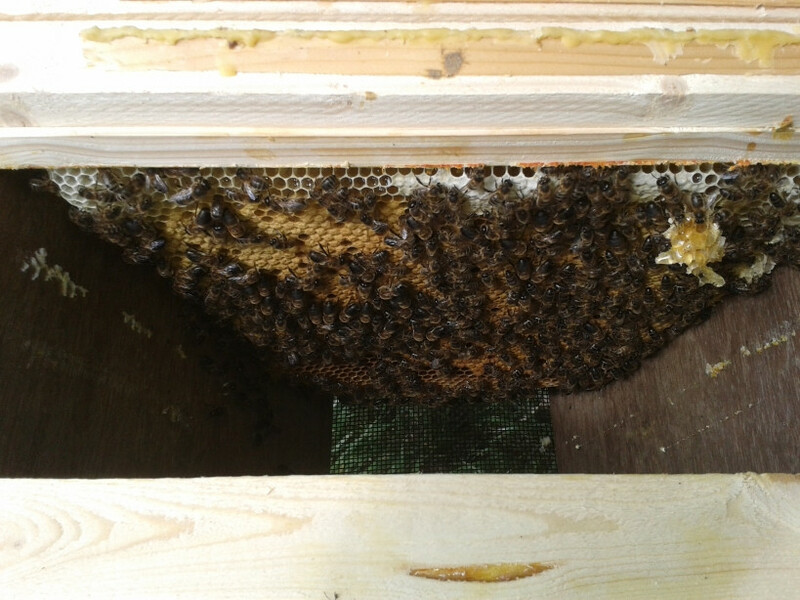 The bees have built the comb out to the walls and joined the 2 pieces together in the centre. 1 of the hangers on this topbar fell off during my brief inspection a couple of weeks ago. The comb didn't break, but I was wary of continuing further with such fresh comb, so this is where I stopped. I breathed a big sigh of relief when I saw this comb. Lots of worker brood on both sides of it. There's a queen here somewhere. This was a 220mm piece of comb that was cut from a national frame. The wire hangers are clearly visible here. More importantly, there's lots more brood. The laying pattern is a little bit spotty, but I don't think it's anything to worry about. Overall, I am very happy with the results of this experiment. The wire hangers can be easily removed without damaging the comb, leaving behind a "standard" topbar and reusable hangers. Total prep time to cut and bend the wire to make the hangers and drill the holes is less than 3 minutes per bar, maybe less than 2 minutes if you are doing a lot of them. Total cost is almost nothing, since I have a roll of wire for electric fencing just lying around. Edit: Wire coat hangers would also be a suitable raw material for making these comb hangers. I reckon you'd get about 8-12 comb hangers from each coat hanger. Great job! Neat solution to the comb-hanging problem and demonstrates the benefits of taking things slowly and applying thought at every stage. An assistant would have been very useful during this project, but I think if I can manage it alone with just 2 months experience, it should be no problem for anyone with more experience. As you said, planning ahead and anticipating potential problems is key when doing things like this. I'll be transplanting a 6 frame national nucleus to 9 top bars next week (hopefully). I will drill 6 holes in each comb guide so that I have some flexibility in hanger placement if things go wrong or comb breaks during the process. I'm hoping that I can convince someone local to do some photography for me. I'd be delighted to hear about others experiences if they decide to try a transplant using comb hangers like these. What a great thread Johno, thanks for taking the time to post your pics and how you did it. I'm going to be doing this next year. As you said it's good to plan ahead.